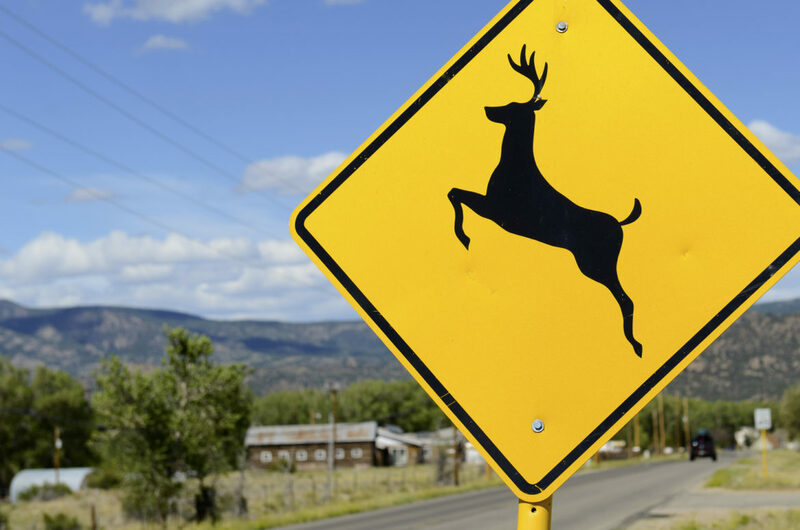 Drive a rural highway, particularly in the colder months and at dusk or after dark, and the primary road game often comes down to dodging deer. Each year, drivers lose that fight, and vehicles collide with animals at least 1,600 times, according to New Mexico Department of Transportation. The department estimates that tally of officially reported accidents underrepresents the problem by half. “You stand a chance of hitting a large game animal virtually anywhere in the state,” says Mark Watson, terrestrial habitat specialist with the Department of Game and Fish. The Transportation Department’s 2016 report found 738 instances of serious injury or fatality from 2002 to 2016 as a result of these accidents. They also totaled $12.6 million in property damages and $6 million in personal injury, according to the department. And the number of accidents has been increasing. Expanding cities and other infrastructure, plus drought and other stressors on wildlife habitat, are expected to continue that uptick. A bill introduced this session seeks to reverse that trend. The “Wildlife Corridors Act,” SB 228, is cosponsored by Senate Majority Whip Mimi Stewart, and Representatives Joanne Ferrary (D-Las Cruces) and Georgene Louis (D-Albuquerque). It tasks the Departments of Transportation and Game and Fish with looking for the most likely locations for these crashes: wildlife corridors. Large mammals, specifically deer, elk, pronghorn, bear, cougars and bighorn sheep, moving through the landscape among pieces of habitat fragmented by human development at some point have to cross roads. In the past, routine construction projects have been used as a time to try to add measures to deter them from crossing where they’re likely to be hit. No federal law requires the assessment, Watson points out, but previous legislative memorials have directed the Department of Transportation to seek out high-priority areas for these projects. Already, US 550 south of Cuba and Interstate-25 through Raton have made the top of the list. Tijeras Canyon, where Interstate-40 cuts between the Sandia and Manzano mountains, already boasts fencing and the state’s only wildlife crosswalk, a project Watson calls their “flagship.” The number of deer hit there has declined. “They’re doing some of this work, but it’s kind of as opportunities arise, and what we really need is direction to go out and do it in a comprehensive manner,” Michael Dax, with Defenders of Wildlife, said as an expert witness on the bill when it was heard by the Senate Conservation Committee on January 31. This bill would direct the two departments to map high-use wildlife crossings and prioritize areas with a high potential for conflict where installing culverts, overpasses, fencing or lights could steer animals away from roads. Already, data collected by the Department of Transportation indicates certain hot-spots around the state, with greater numbers of these accidents in San Juan, Grant and Rio Arriba counties. This “wildlife corridors action plan” is to be open to public comment and submitted to the governor and Legislature by Jan. 15, 2020. Tribes would collaborate with state officials on this process. Dax, with Defenders, calls migration corridors “the next big hot topic in wildlife conservation,” as research has traced some of the massive migrations followed by iconic species. “It’s important that we don’t just have these island habitats that are separated by developments that species can’t cross,” he says. Nearly half of New Mexico residents believe fish and wildlife habitat loss is an extremely serious problem, according to a survey by Colorado College’s Conservation in the West poll, and almost all of them support wildlife corridor conservation. That same survey found that in most western states, a third to nearly a half of people shared that belief, and New Mexico ranked highest for level of concern. Support for conserving migration corridors was even higher, with more than half in strong support through the West—and 64 percent of New Mexicans. Only 9 percent of New Mexico residents said they opposed the idea. The Senate Conservation Committee voted to pass the bill and it heads next to the Finance Committee. The only vote against it came from Senator Pat Woods (R). “There’s court cases out there with livestock on the highway and they’re constantly suing ranchers because they say there’s some neglect going on because livestock get on the highway,” Woods said during the committee meeting, citing concerns over potential liabilities to stockowners as the reason he’d vote against it. Other lawmakers countered that measures to keep wildlife off the road would likely also keep cows from it. Adding this scale of protection for wildlife would bring New Mexico in line with other western states on shifting approaches to landscape-scale conservation. The Western Governors’ Association Wildlife Corridors Initiative aligned 16 states on preserving migration corridors across state lines in 2007. Colorado and Arizona have already made better strides on this front than New Mexico, and Watson says some of Arizona’s research has helped inform culvert and passage size. Research from Wyoming also shows pronghorn don’t use underpasses—they want to travel over the top of the highway instead. Considering one of the locations kicked around as the possible site for the first wildlife overpass in New Mexico, Tijeras Canyon, Dax points to benefits beyond preservation.